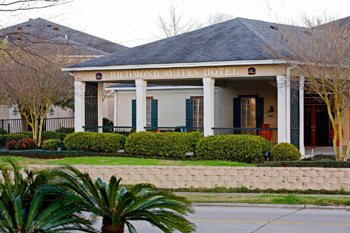 Best Western Plus Richmond Inn & Suites is near the Louisiana State Capitol - hotel amenities include free Internet and full breakfast. 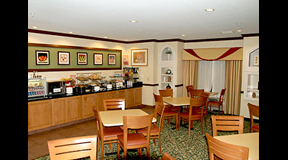 The BEST WESTERN PLUS Richmond Inn & Suites is a 100% non-smoking hotel and s committed to providing the best in customer service and accommodations at an affordable rate. 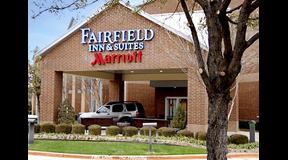 The pet-friendly hotel is situated near many businesses and area attractions - perfect for any traveler. 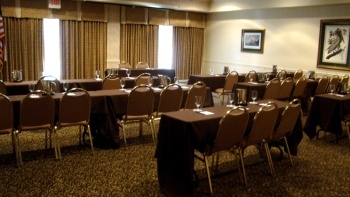 Hotel guests are close to Louisiana State University, Baton Rouge corporations and Casino Rouge. 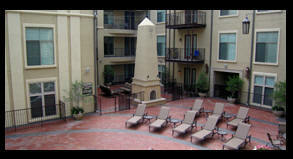 RHO Wireless was selected to provide the WiFi for the free wireless network. Wi-Fi coverage (802.11n) has been provided for the Gatehouse, Pool, Tennis Court and is being deployed for the Guest Rooms. 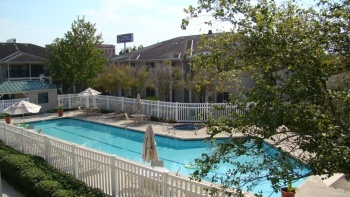 The BEST WESTERN PLUS Richmond Inn & Suites is a six building complex with one single story "Gatehouse" and five two story buildings providing guest accommodations. 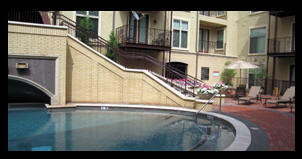 There are a total of 141 rooms and suites. 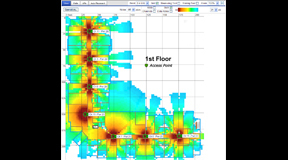 RHO Wireless uses the AirMagnet Site Survey Planner Module for the Predictive Coverage Analysis and to create the network plan. 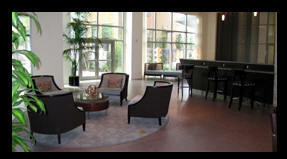 An overlay is created on the the floor plans by drawing colored lines that represent the wall configurations. Differentiation of the various wall types and their attenuation factor is used by the planning software to simulate the access point's expected RF energy. 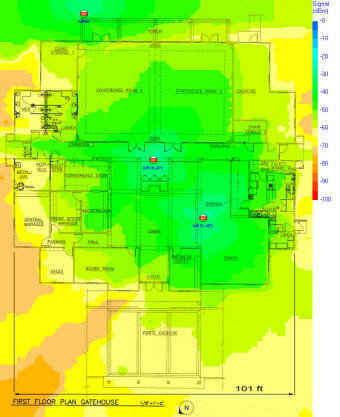 The image to the left shows the predictive coverage assessment for the Gatehouse that encompasses the lobby and reception area, the board room, conference area, bar, and fitness gym. Two dual band Meraki MR16 access points were used for wireless coverage and connectivity for 802.11 b/g/n and 802.11 a/n clients. The Meraki Cloud Controller automatically detects clients with 802.11 a/n capability and steers them to that band for a better WiFi experience. 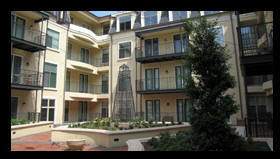 A Predictive Coverage Analysis was completed for each of the five buildings. Meraki MR12 single band 802.11 b/g/n access points are being used for WiFi access in the Guest rooms. A Meraki MR66 dual band access point was used to provide 802.11 b/g/n and 802.11 a/n WiFi access for the pool, tennis court and courtyard. The WiFi network has seen a steady increase in clients and bandwidth with 448 GB of data used by 457 clients in the last 30 days.